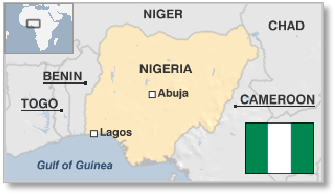 Nigeria (the Federal Republic of Nigeria) borders Benin in the west, Chad and Cameroon in the east, and Niger in the north. Its southern coastline abuts the Gulf of Guinea of the Atlantic Ocean. Many empires have ruled Nigeria. The Nok ruled the north from 500 BC to 200 AD, the Kanem-Bomu were powerful from the 9th century, and Hausa kingdoms established trade routes in the 14th century. In the south Nri (Igbo) ruled from the 10th century, Yoruba were prominent in the 12th century, and Oyo tribes peaked in the 17th century in the southwest. In the 19th century the Fulani (Sokoto) empire controlled the northern region which was broken up into European colonies in 1903. In 1472 Portugal had begun trading slaves from Lagos, turning to agriculture when the slave trade was banned by Britain in 1807. The UK went on to annex Lagos as a Crown Colony in 1861, expanding inland. In 1901 Nigeria became a British protectorate which united in 1914. The federation achieved independence in 1960 but fell into civil war until 1970 as tribal regions fought for autonomy. After repeated military coups, Nigeria became a semi-stable democracy in 1999 although the northeast is under attack from the Islamist Boko Haram and unrest continues in the delta as locals demand more control of oil revenue. The far south of Nigeria is tropical rainforest, in part replaced by grassland, cut by valleys of the Niger and Benue rivers and their tributaries which converge into the huge Niger Delta. The southern area forms an extensive salt water mangrove swamp and north of this is fresh water swamp. In the southeast lies the Obudu Plateau with coastal plains in both the southwest and the southeast. To the west of the Niger river are highlands while to the southeast of the Benue are hills and mountains, which form the Mambilla Plateau, with the highest point at Chappal Waddi of 2,419m. This plateau extends across the border with Cameroon. Everything in between the south and north is savannah. In the Sahel region in the far north the Sahara Desert is encroaching and in the northeast lies Lake Chad shared with Niger, Chad and Cameroon. The country began producing oil in 1957 from the Delta. Soon similar oil fields were identified offshore and output here began in 1965. Since then 100s of fields have been developed. Nigeria joined OPEC and restricted oil production but is now trying to increase capacity. Some fields remain shut-in due to internal tensions. Onshore and shallow water producing areas are mature but Globalshift believes that output from shut-in fields, processing of NGLs, and extensive deep water prospects will allow growth in capacity. 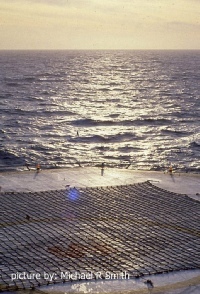 Deep water production began in 2003. Large volumes of associated gas have been flared but wastage has declined since the Escravos gas gathering system came onstream in 1997 and the Bonny LNG plant in 1999. New LNG trains and regional pipelines are also planned. Nigeria is a Federal Republic with the president as head of state and government elected to a maximum of two 4-year terms. The president's power is checked by a 109-seat Senate and a 360-seat House of Representatives combined in a bicameral body called the National Assembly. There are active secessionist movements and there has been a long history of corruption driven by oil money. The oil and gas industry is overseen by the Federal Ministry of Petroleum Resources. The Department of Petroleum Resources (DPR) established in 1970 before the Ministry is the technical Department that regulates and monitors activities of the industry. The state-owned Nigerian National Petroleum Corporation (NNPC) established in 1977 undertakes commercial ventures in the industry on behalf of the Federal Government. Nigeria has been a member of OPEC since 1971.